Total and BEAUTIFUL trolling of Vegetarians/Vegans! HOW DID THIS GET PRINTED ON ANYTHING?! 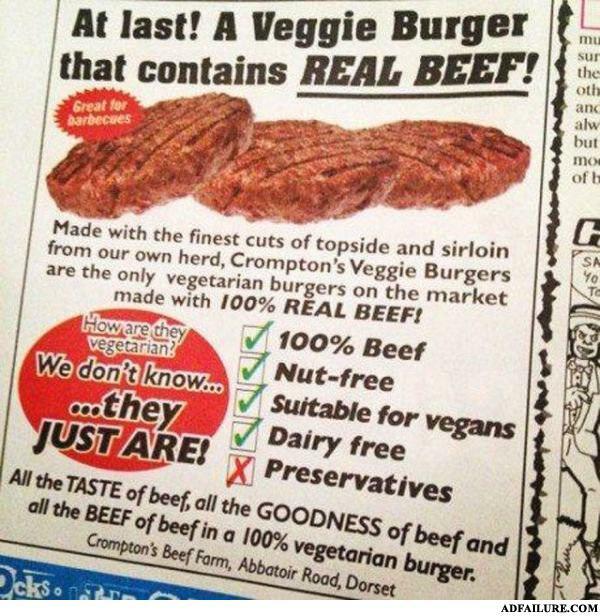 "Veggie Burger, now WITHOUT preservatives! All the taste of beef, all the GOODNESS of beef and all the BEEF of BEEF in a 100% vegetarian burger. That sentence alone is more less vegetarian than this beef! HELLO MY DEAR FRIENDS AROUND THE WORLD, BE CAREFUL OF THE FAKE ILLUMINATI PEOPLE WHO CLAM TO BE A MEMBER OF. THE ILLUMINATI, THEY ARE HERE TO MAKE AWAY WITH YOUR MONEY SO BE CAREFUL NOT TO FALL A VICTIM TO THEIR LIES, IF YOU REALLY WHICH TO BE A MEMBER PLEASE CONTACT MR wilsyen phillip. HE IS A TRUE MEMBER OF THE ILLUMINATI, I NEVER THOUGH I COULD BE A MEMBER UNTIL NOW. MR wilsyen phillip HELP ME BECOME A TRUE MEMBER. SO IF YOU LOOKING UP TO BE A MEMBER BE WISE NOW AND DON'T BE A VICTIM TO THE INTERNET SCAM THAT CLAM THEY ARE MEMBER OF THE ILLUMINATI. Are you a musical, a businesses man? Student or politician? Be wise now and don't make the mistake others made in the past. Mr wilsyen phillip is a man of his word and he does not fail when he promise. for more information contact mr fortune on (((illuminatiorderworld1@gmail.com)))) )) and be a true member of the illuminati..